#405 — This picture was taken of a beautiful sunset near the entrence to Yosemite National Park just a couple miles west of Groveland and Big Oak Flat. 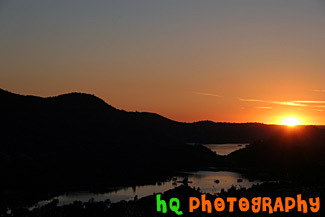 You can see part of the reservoir to Don Pedro Lake in between the hills. Yosemite is located in east-central California and lies 105 miles north of Fresno, 195 miles east of San Francisco, 313 miles north of Los Angeles and 350 miles northwest of Las Vegas. The gross area acres for the national park is Gross Area Acres for 761,266 and receives about 3,300 total recreational visits per year. The elevation in the park ranges from from 2000 feet to over 13,000 feet. The cliffs, waterfalls, steep mountains and deep lakes of Yosemite National Park were all formed over millions of years by earthquakes, glaciers and numerous other forces of nature. 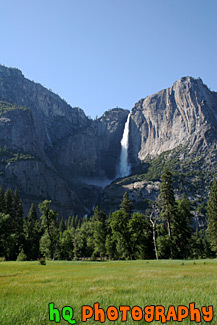 #400 — This is a scenic picture taken of Yosemite Falls during the late spring season in the popular California National Park. Yosemite Falls is the world's 5th tallest waterfall, but North America's largest and most popular waterfall in Yosemite's National Park. This waterfall is actually composed of three falls: Upper, Middle Cascades, and the Lower fall. Together they have a combined height of 2,425 feet which is more than 9 times the height of Niagara Falls. Perhaps the easiest place to view the falls is the Yosemite Falls Parking Area across from Yosemite Lodge. 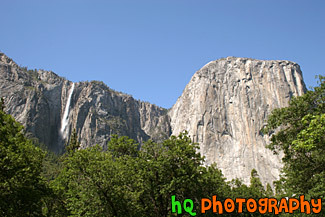 #451 — A scenic picture taken of Yosemite Falls at Yosemite National Park located in California. Yosemite Falls is the world's 5th tallest waterfall, but North America's largest and most popular waterfall in Yosemite's National Park. This waterfall is actually composed of three falls: Upper, Middle Cascades, and the Lower fall. Together they have a combined height of 2,425 feet which is more than 9 times the height of Niagara Falls. Perhaps the easiest place to view the falls is the Yosemite Falls Parking Area across from Yosemite Lodge. 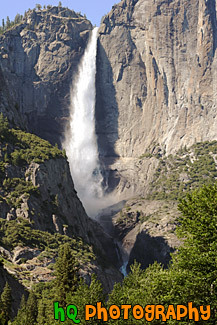 #455 — A scenic picture taken of Yosemite Falls in the popular California Yosemite National Park. In this picture you can see the reflection of the falls in the water just in front. This waterfall is actually composed of three falls: Upper, Middle Cascades, and the Lower fall. Together they have a combined height of 2,425 feet which is more than 9 times the height of Niagara Falls. Perhaps the easiest place to view the falls is the Yosemite Falls Parking Area across from Yosemite Lodge. #435 — A scenic picture taken of Yosemite Valley on a beautiful partly cloudy day in Yosemite National Park located in California. Looking down you can see Merced Canyon and in the distance you can see a great view of Bridalveil Falls. Yosemite Valley is referred to as "the incomparable valley" and is seven miles long and one mile across at the widest point. It is the most visited section of the national park. The Valley was formed by glacial erosion over millions ofyears. #682 — A scenic picture taken of Bridalveil Fall located in Yosemite National Park, California. Although Bridalveil Fall appears small when viewd against the surrounding canyon walls, it actually has a 620 foot drop, the height of a 62 story building. Bridalveil Fall is one of the most prominent waterfalls in the Yosemite Valley in California, seen yearly by millions of visitors to Yosemite National Park. When the wind blows briskly, the waterfall will appear to be falling sideways. 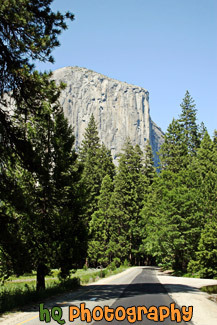 #1405 — A scenic vertical picture taken of El Capitan located in the Yosemite National Park in California. El Capitan is the largest known exposed granite block in the world and stands on the north side of the entrance to Yosemite Valley. #652 — A scenic picture taken driving towards El Capitan with Forest Road leading towards it in Yosemite National Park, California. This massive, granite monolith stands 3,593 feet from the base to summit and and is claimed to be the largest single monolith of granite in the world. From spring to fall, climbers come from all over the globe to scale El Capitan. 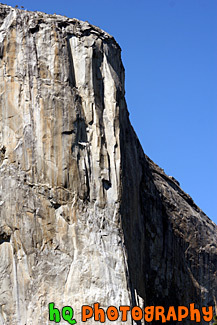 #616 — A vertical close up picture taken of El Capitan which is located in Yosemite National Park, California. This massive, granite monolith stands 3,593 feet from the base to summit and and is claimed to be the largest single monolith of granite in the world. From spring to fall, climbers come from all over the globe to scale El Capitan. 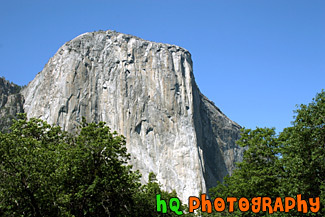 #505 — A scenic picture taken of El Capitan which is located in Yosemite National Park, California. This massive, granite monolith stands 3,593 feet from the base to summit and and is claimed to be the largest single monolith of granite in the world. From spring to fall, climbers come from all over the globe to scale El Capitan. #986 — A scenic vertical picture taken of Yosemite National Park from a hill looking towards Half Dome which you can see in the distance. It is located in the middle of the photo under the big, white, puffy cloud. Half Dome stands at the elevation of 8,840 feet. Its unique profile has become a symbol of Yosemite and geologists presume that its missing half had fallen off when the Ice Age glaciers passed through. It is made up from a type of granite. 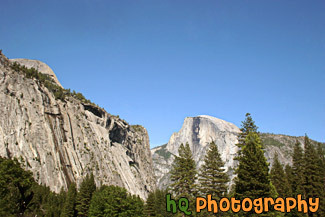 This photo was taken on a beautiful blue sky sunny day at Yosemite. #781 — A scenic picture taken of the famous the Half Dome granite rock on a sunny day located in Yosemite National Park, California. This picture was taken during late spring / early summer. 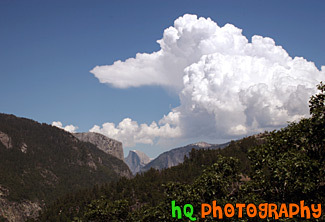 Half Dome is one of Yosemite's most famous landmarks. Half Dome stands at the elevation of 8,842 feet. It is made up from a type of granite, plutonic rock. Yosemite National Park's Half Dome's missing half is presumed to have fallen off when the Ice Age glaciers passed through. 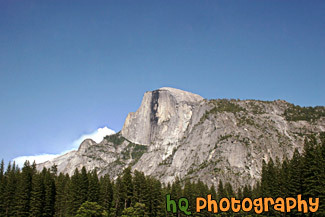 #779 — A scenic picture taken of Half Dome which is located in Yosemite National Park in California. This picture was taken during late spring / early summer. Half Dome is one of Yosemite's most famous landmarks. Half Dome stands at the elevation of 8,842 feet. It is made up from a type of granite, plutonic rock. Yosemite National Park's Half Dome's missing half is presumed to have fallen off when the Ice Age glaciers passed through. 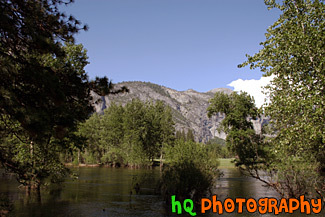 #987 — A scenic picture taken of a small lake/pond, blue sky, and trees located in the middle of Yosemite National Park. #996 — A scenic landscape picture taken of green trees, blue sky, puffy clouds, and a country fence located in Yosemite National Park. #1406 — A scenic picture taken of El Capitan and a seasonal waterfall located to the left of the big granite rock structure location in Yosemite Valley. This picture was taken in the late spring on a sunny day with green trees seen below. 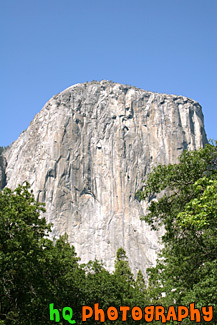 El Capitan is claimed to be the largest single monolith of granite in the world. #646 — A scenic picture of Yosemite National Park taken from a hill looking towards Half Dome which you can see in the distance just to the left and under the big, white, puffy cloud. Half Dome stands at the elevation of 8,840 feet. 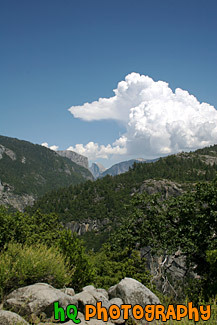 Its unique profile has become a symbol of Yosemite and geologists presume that its missing half had fallen off when the Ice Age glaciers passed through. It is made up from a type of granite. 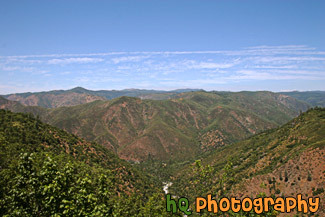 #456 — A scenic picture of the mountains and hills surrounding Yosemite National Park and the Tuolumne River flowing below. The Tuolumne River was designated Wild and Scenic in 1984 by the United State Congress. The Wild and Scenic Act provieds that rivers possessing extraordinary scenic, recreational, fishery, or wildlife values shall be preserved for the benefit and enjoyment of Forest visitors. It also limits land development surrounding these rivers and water diversion from them. The Tuolumne River begins as small rivulets trickling from Mount Dana and Mount Lyell in Yosemite National Park high in the Sierra Nevada. It ends at the San Joaquin River. 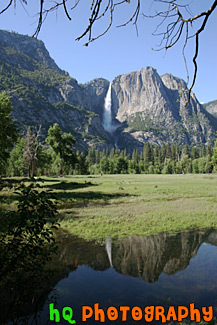 #621 — A scenic picture taken of the tall Yosemite Falls with a big grass field in the foreground. Yosemite Falls is located in Yosemite National Park in California. Yosemite Falls is the world's 5th tallest waterfall, but North America's largest and most popular waterfall in Yosemite's National Park. This waterfall is actually composed of three falls: Upper, Middle Cascades, and the Lower fall. Together they have a combined height of 2,425 feet which is more than 9 times the height of Niagara Falls. Perhaps the easiest place to view the falls is the Yosemite Falls Parking Area across from Yosemite Lodge. 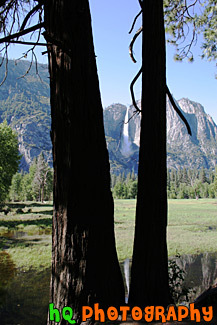 #789 — A close up picture taken of Yosemite Falls with green trees in the foreground. This picture was taken during late spring and a sunny day with blue sky. 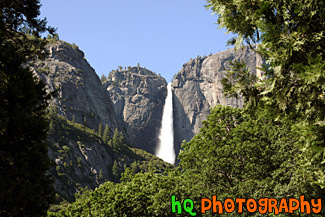 Yosemite Falls is a waterfall actually composed of three falls: Upper, Middle Cascades, and the Lower fall. In this picture you can only see the Upper Falls. Together they have a combined height of 2,425 feet which is more than 9 times the height of Niagara Falls. Perhaps the easiest place to view the falls is the Yosemite Falls Parking Area across from Yosemite Lodge. 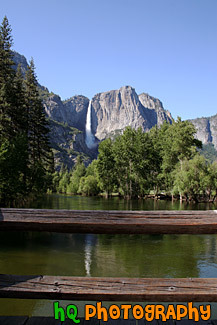 #705 — A scenic picture taken of Yosemite Falls in the distance with a wood railing overlooking some water in the foreground. Yosemite Falls is located in Yosemite National Park which is located in east-central California and lies 105 miles north of Fresno, 195 miles east of San Francisco, 313 miles north of Los Angeles and 350 miles northwest of Las Vegas. 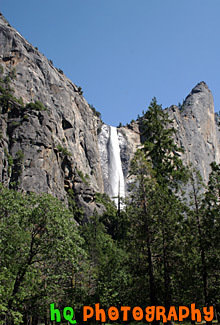 The Yosemite waterfall is actually composed of three falls: Upper, Middle Cascades, and the Lower fall. Together they have a combined height of 2,425 feet which is more than 9 times the height of Niagara Falls. Perhaps the easiest place to view the falls is the Yosemite Falls Parking Area across from Yosemite Lodge. 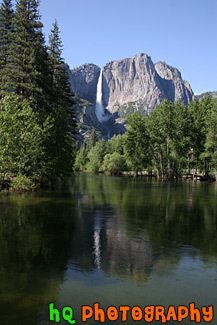 #728 — A scenic picture taken of the famous Yosemite Falls from a distance with beautiful foreground of trees, rocks, and water during a sunny day in early mid June. This waterfall is actually composed of three falls: Upper, Middle Cascades, and the Lower fall. Together they have a combined height of 2,425 feet which is more than 9 times the height of Niagara Falls. 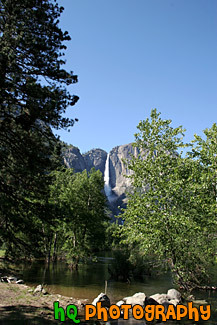 #788 — A close up picture taken of Yosemite Falls looking through green trees and blue sky in the background. Yosemite Falls is located in Yosemite National Park in California. 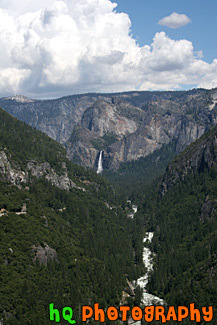 Yosemite Falls is a waterfall actually composed of three falls: Upper, Middle Cascades, and the Lower fall. In this picture you can only see the Upper Falls. Together they have a combined height of 2,425 feet which is more than 9 times the height of Niagara Falls. Perhaps the easiest place to view the falls is the Yosemite Falls Parking Area across from Yosemite Lodge. #780 — A scenic picture taken of a church located inside Yosemite National Park. 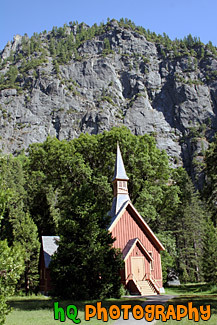 This picture of the Yosemite chapel was taken in late spring / early summer.